Heat oven to 350°F. In large bowl, break up cookie dough. Stir or knead in flour and almond extract. Knead dough with hands until well mixed. With lightly floured hands, shape dough into 1 1/2-inch balls. Roll balls in nonpareils to coat completely. Arrange in circle on ungreased cookie sheets, 3 inches apart and 2 inches from edge. Securely insert wooden stick into each ball with end pointing toward center of cookie sheet. Bake 15 to 16 minutes or until golden brown. Cool 2 minutes; remove from cookie sheets to cooling rack. Cool completely, about 15 minutes. In small bowl, mix half of the frosting with black food color. In another small bowl, mix remaining frosting with green food color. Place each color frosting in separate small resealable freezer plastic bag; cut off tiny corner of bag. 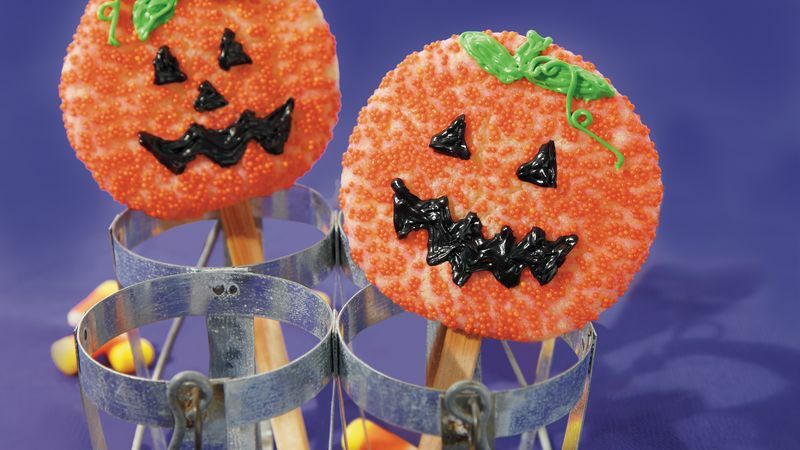 Squeeze bags to pipe jack-o’-lantern face and pumpkin stem on each cookie.